With just one week before we begin to get inundated with blockbusters for four months, that doesn't mean we're without films that can throw up some big numbers in the box office charts. Two of this week's new releases will be in double digits and the possibility for much, much more. As Tyler Perry movies continue to confound all notions of criticism, appeal and even basic economic demand theory, I find myself at a loss to say much more about his films and their continued success. Obviously, Perry knows his market and finds it nearly inexhaustible, with his films coming out at the apparent rate of one every six weeks (really it's just every six months, but still). He doesn't even screen his films for critics anymore, because what would be the point? 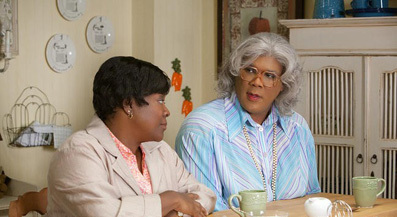 Madea's Big Happy Family is his latest in this line, and that first word in the title is the crucial one. When his films revolve around his elderly transvestite alter-ego, the box office jumps from the mid-teens to well above that. That sassy grandmother just hits all the right notes with Perry's fans, so why not give it to them? The plot.. well, who cares, it's more of the same, right? Cast-wise, it's thinner than usual, with Bow Wow, Grey's Anatomy's Loretta Devine and the Old Spice Man Isaiah Mustafa being the most notable names. Does it look good? Who knows, and more importantly, who cares? Opening at just under 2,300 venues, it should grab an opening weekend of $32 million. And now for films that I can say something about. Water For Elephants has all the look of a prestige film – a star-laden cast, adaptation from a best-selling novel, and a unique, metaphorical setting. You'd almost call it a surefire hit except for the fact that we have a very similar film to compare it to in recent memory – The Time Traveler's Wife. And of course, there's that release date – if the studio really had faith in it, why release it in April?